Mak Mai Village 2. A beautiful 2 bedroom fully renovated home just on the outskirts of town, set within a gated secure village on a well landscaped 68 Sq Wah plot (272 Sq.m). This home offers fantastic value for money as the home has received extensive upgrades to this relatively new house to bring the property up to full European specification. Externally the home includes a 50 sq.m carport and driveway, a small garden with ornate Thai sala. Around the property all windows and doors are German UPVC. Inside there are 2 generous bedrooms and 2 bathrooms. The master bedroom has a custom walk-in wardrobe, plus a luxury bathroom with the latest Stainless steel rain showers and corner Jacuzzi. The full European kitchen has Gas Hob, Oven, Extractor fan and twin under counter stainless steel sinks. Finishing touches include a large open plan living room which has the latest 64in Samsung TV, twin stainless steel water tanks, and new gate, wall, and flower beds to the front. 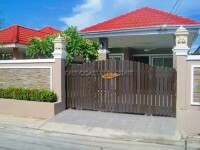 This house is a bargain at just 3,200,000 THB. Owned in Thai name ownership, with all tax and transfer fees split equally with the buyer.